As you are preparing for your Labor Day BBQ, don't forget the Bacon! Bacon + Grill = Grill Pinz. 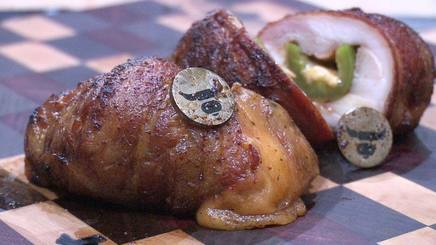 Grill Pinz are the must have tool for making perfectly wrapped Bacon goodies on your grill! They are specifically designed to hold Bacon while grilling, eliminating the shortcomings and hazards of using wooden toothpicks on the grill. These stylish stainless steel pins will hold your Bacon securely and safely! No matter what you are grilling, Grill Pinz have you covered...in BACON! !